The nuclear disaster in Japan is still emerging but political consequences are widely debated. The sensitive reaction in Germany is seen as indication for a more general distrust to energy policy rather than as a spontaneous outbreak of anxieties. Multiple changes in our energy scenario are debated. This contribution aims at underlining options and contributions of chemistry to the energy challenge covering only a fraction of the multi-dimensional problem. Despite the regional character of the present energy discussion (Germany accounts for about 2% of the global energy consumption) it is felt that the underlying concepts are of more general relevance. A scientific request is to document and to study instantaneously the events and damages of the nuclear site in Japan. Then we can at least learn as much as possible before the whole complex may become inaccessible in the course of burying the remains. Even if the initiation of the catastrophe may be unique, the course of events following the natural disaster may be not unique and thus may contain much information useful for analyzing chemistry issues in nuclear complexes. The now frequent call for (rapidly) replacing nuclear by conventional and regenerative energy carriers brings about several issues relevant for chemistry as science. First it may be considered that energy conversion and chemistry are synonyms for the same phenomenon of controlling chemical reactions. While the chemist is mostly concerned with the results of modified molecular structures, the engineer is interested in the energetic consequences of typically total oxidation reactions of energy carriers. The control of chemical reactions involves manipulation of molecular energy barriers and laws of thermodynamics determine the use of converted energy. Chemistry is thus at the centre stage when it comes to discussions about effective and sustainable energy scenarios. The large-scale use of regenerative energies replacing fossil energy carriers is not possible without chemical storage strategies. Unfortunately, the contribution of catalysis as the relevant science and technology of mastering molecular energy barriers is not well enough developed to rapidly design efficient energy storage processes from fundamental insight. Traditional empirical technology development will thus co-exist with fundamental science being late in the game. It would be highly desirable to advance fundamental science of chemical energy conversion simultaneously with the applied scientific and technological research offensive being necessary to use non-nuclear and climate-neutral energy carriers. The energy scenario for Germany illustrates the scales at which chemistry needs to contribute to the challenge. Fundamentally, it is clear that research efforts even if they target incremental modifications require a long time period for becoming effective on the scale of the national energy demand. It should also be kept in mind that other economic regions exhibit greatly different energy supply structures and thus require different strategies. A key concept is that multiple approaches are needed; the availability of several parallel strategies for reducing the importance of nuclear and fossil energy carriers should be followed in a temporal staggered fashion. We need for the next decades several generations of systemic approaches operating in dynamical societal and economic boundary conditions. It is essential that we check all suggestions at an early stage for their sustainability and scalability. We should not compromise on the insight that energy conversion and climate stability are two facets of the same systemic interdependence; replacing nuclear risks by climate risks or replacing local risks by exporting them to other parts of the world are no solutions. As the timeframes for having such lines of technologies operational in relevant scales measure in decades it is imperative to start now with a large and diverse program of research stretching between fundamental and applied sciences to provide the technology evolution and the training opportunities for the large number of experts required. 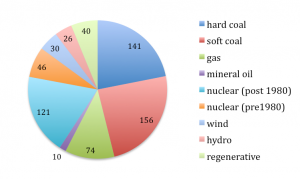 In Figure 1 we see the mix of energy carriers used in Germany for electricity generation. Still about half of the primary energy comes from coal, the other half is dominated by nuclear energy. Even if the recently questioned “old” (pre-1980) nuclear complexes would be removed from the mix, the large contribution from the “new” reactors cannot easily be replaced by any other energy carrier within the next decade if we maintain the target of massive greenhouse gas reduction. It may be possible to retrofit old coal fired power plants with modern high-efficiency combustion processes to replace some capacity of the old reactors. As then also the location of such plants may be reconsidered in the light of the to be constructed “smart grid”, it may be wise to build new coal fired power stations for more electricity at the same CO2 emission. To combine such activities with compulsory CCS strategies should be carefully considered despite its superficial attractiveness. It is simply not possible to evaluate the benefit/risk ratio of transferring large amounts of CO2 into uncontrolled underground storage. The still reactive gas with respect to rock formation processes does not decay and may induce unwanted consequences in time periods unforeseeable by us today. 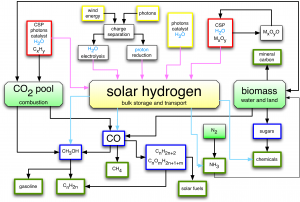 There are serious alternatives to use CO2 chemically in relevant quantities once solar hydrogen is available which is likely the target of highest priority for chemical energy science. The essential target of limiting greenhouse gas emission can be achieved by reducing the amount of bio-available carbon through carbon capture and use and through chemical transformation of biomass into mineral carbon. In the more distant future the demand for transportable non-fossil energy carriers will require the large-scale conversion of carbon sources into molecular energy storage systems using solar hydrogen even when the climate issue is ignored. The dimension of such a chemical synthesis effort may be estimated from the fact that the largest fraction of primary energy carriers in Germany is with about 30% the import of mineral oil going largely to transportation. Sustainability requires not inheriting risks to further generations by loosing control over the fate of CO2 under ground. If additional capacity for electricity generation is needed, systems should be chosen that are capable of interacting favorably with the smart grid and thus being flexible in their output. These are gas-fired systems. The gas will first be fossil but can over decades of time gradually be replaced by regenerative sources coming from CO2 hydrogenation[8a] once water splitting is operational. This chemical storage process must not take place in Germany but could be one outlet of solar energy harvesting in regions rich in sunshine. The much requested increase of the share of existing regenerative energy sources to the energy mix of Figure 1 will in foreseeable future even with large additional installations only partly compensate for nuclear capacity as no mass storage of primary electricity is available. The smart grid will, however, increase the relevance of the regenerative electricity production capacity through better load management once it is available. The reader missing more quantitative statements may be reminded here that the necessary realistic system analysis is in the light of the many variables involved and without having sufficient accessible experimental experience from demonstration installations a still critical task that needs to be performed by experts in close collaboration with the sciences involved. The most critical variable will be the accepted additional CO2 emission being a societal rather than a chemical issue. 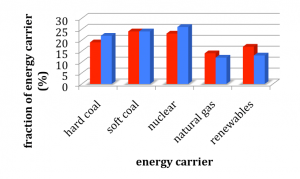 The role of biomass as storable and regenerative energy carrier is already substantial in the energy mix shown in Figure 1. It may further increase in very limited dimensions by better uses of agricultural wastes and of wood not only for electricity generation in large plants but for local heating applications reducing the greenhouse emission load. Higher generation uses of biomass concern their chemical de-polymerization and de-oxygenation rendering them interesting chemical feedstock as replacement of mineral oil. Great care is needed not to stimulate excessive energy farming in Germany or abroad with negative consequences for ecosystems and economical aspects of food production. In Figure 2 a projection from the German power industry of the change of the mix of energy carriers for electricity generation is shown for the relatively short time of 8 years from now. Despite assumed substantial efforts the overall modification of the energy mix is slow on the grid scale. The decommissioning of old coal-fired power stations and of old nuclear plants are the drivers of more use of natural gas and of more regenerative energy supply. The reduction of CO2 emissions from increased use of regenerative energy will be largely compensated through enhanced use of fossil energy carriers compensating for the reduced use of nuclear power. A complete shutdown of all nuclear power plants in 2018 would lead at the present level of electricity consumption to an annual emission of 60 – 120 million tons of CO2 in addition to the total emission from electricity production depending on the fuel mix. The figure illustrates the slow response frequency and the enormous challenge to phase out substantial amounts of nuclear or fossil energy carriers. The use of less primary energy is thus a very attractive target for research and technology. The losses in energy conversion are the greatest single “use” of primary energy carriers amounting to about 1300 TWh/a (2007) which may be seen in contrast to the total electricity production from nuclear reactors amounting to 160 TWh/a (2007). Although many losses cannot be overcome there are opportunities for process and material chemistry to improve on that wasteful situation. This task is not only a challenge for chemistry but to a large extent also for other disciplines designing and operating the complex network of energy converting systems. An enumeration here would far exceed the format of the paper. The critical relevance of non-scientific societal and economic insights and adaptations can only be mentioned. indicates the suitability of methane as energy carrier with a low relative greenhouse gas footprint in comparison of carbon from coal. As problematic as the generation of electricity from non-nuclear carriers is for the environment, as much it becomes apparent that any hypothetically increased generation of greenhouse gas from electricity production may be compensated in other areas of energy usage: only the sum of all greenhouse gas emission is relevant. The most abundant regenerative energy within the next decades is primary electricity from charge separation devices. The storage of wind and of solar energy is a key target of chemical energy conversion. This can be achieved in rather limited amounts by thermo-mechanical storage and by battery systems in mobile (e-mobility) and stationary systems. In grid dimensions, water will have to be split as the most abundant precursor to energy carriers. 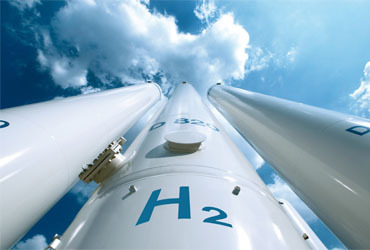 The resulting hydrogen can be stored and re-converted to electricity locally or can be further converted to transportable solar fuels. Many of the relevant chemical reactions are known but few function with sufficient effectiveness and stability. We want to operate these reactions outside of chemical production complexes and we need catalysts operating reliably under conditions of variable load. The potential of chemical energy conversion with molecular energy carriers is summarized in Figure 3. 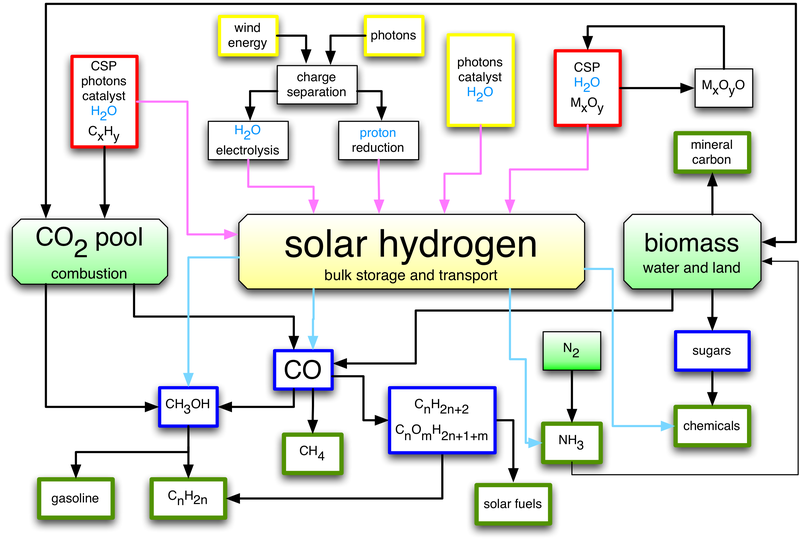 The flow chart of key components of a “solar refinery” indicates how hydrogen generation options can be combined with molecular precursors to form a couple of platform molecules. 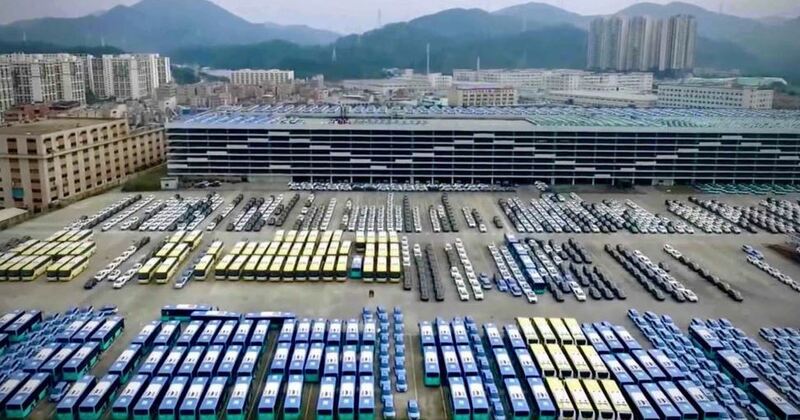 These can be further converted into useful classes of energy carriers in a similar way as present refineries produce a range of petrochemicals. This diagram exemplifies the systemic character of chemical energy storage. It further highlights large areas of fundamental and applied chemical science to be covered for a sustainable mode of regenerative energy storage. The solar refinery concept assumes that a maximum of existing infrastructure and technologies should be used in continuation. A prominent exception is the item “solar fuels” where quite clearly novel molecular structures can be introduced with better application characteristics than the pool of hydrocarbons from mineral oil. In further generations of strategies the function of charge separation and chemical conversion of storage molecules water and CO2 may be combined in single processes referred to as “artificial leaf” strategies. Despite the impressive progress in these areas it is clear that still a long time will be needed to develop such systems to dimensions delivering grid-relevant amounts of energy. Chemistry is a critical science in providing strategies for saving energy carriers. The role of adequate materials for countless applications is as obvious as is the resulting relevance of knowledge-based material science. The pivotal role of catalysis to render chemical transformations more effective through control of their kinetics is a long-standing research effort where despite enormous success there is still much room for improvement. The long history of all these efforts teaches us that chemistry, as a science, needs to make some progress before it can contribute to solve challenges in application. The efficiency of catalysis science is limited as we still lack a generic concept unified between the various disciplines as a kinetic phenomenon allowing designing catalytic materials and processes from limited experimental input. The current rushing requests from society to science should not hinder a broad-based fundamental approach towards the energy challenge: the related answers may not necessarily come from areas of mainstream research but may emerge from novel fundamental research as it frequently occurred in the past with breakthrough technologies. The author is much indebted to all members of the ENERCHEM consortium of the Max-Planck Society for numerous discussions, the network of excellence UniCat is acknowledged for providing a platform of interdisciplinary exchange. Distribution of energy carriers for electricity generation in Germany. Red: projection for 2018 after the “Energiewende”, blue data from 2008. Source BDEW 2011 and ref. The solar refinery provides a concept for chemical energy storage science and technologies. Several concepts allow the generation of solar hydrogen (top, CSP for concentrated solar power, one method of solar thermal energy harvesting). Combination with carbon or nitrogen allows the synthesis of platform molecules (blue) that can be further converted to typical refinery products (green boxes) as energy carriers suitable for many existing application technologies. Mineral carbon is a form of CO2 sequestration using waste biomass allowing contributing to the control of greenhouse gas emission without creating risks for future generations. Multiple internal interconnects exist, the use of ammonia as fertilizer for biomass is indicated as an example. The availability of large amounts of clean water is pre-requisite, a resource that may be scarce in future times. aG. Ertl, H. J. Freund, Pysics Today 1999, 52, 32-38; bJ. M. Thomas, Angewandte Chemie-International Edition 1994, 33, 913-937. R. Schlögl, ChemSusChem 2010, 3, 209-222. J. K. Norskov, T. Bligaard, A. Logadottir, S. Bahn, L. B. Hansen, M. Bollinger, H. Bengaard, B. Hammer, Z. Sljivancanin, M. Mavrikakis, Y. Xu, S. Dahl, C. J. H. Jacobsen, Journal of Catalysis 2002, 209, 275-278. K. Voorspools, Renewable & Sustainable Energy Reviews 2004, 8, 599-608. J. C. Stephens, D. W. Keith, Climatic Change 2008, 90, 217-242. M. Aresta, A. Dibenedetto, Dalton Transactions 2007, 2975-2992.
 aG. Centi, S. Perathoner, Catalysis Today 2009, 148, 191-205; bW. Leitner, Coordination Chemistry Reviews 1996, 153, 257-284. J. M. Tarascon, M. Armand, Nature 2001, 414, 359-367. J. Barber, Chemical Society Reviews 2009, 38, 185-196. N. S. Lewis, D. G. Nocera, Proceedings of the National Academy of Sciences of the United States of America 2006, 103, 15729-15735. W. Lubitz, E. J. Reijerse, J. Messinger, Energy & Environmental Science 2008, 1, 15-31. H. Arakawa, M. Aresta, J. N. Armor, M. A. Barteau, E. J. Beckman, A. T. Bell, J. E. Bercaw, C. Creutz, E. Dinjus, D. A. Dixon, K. Domen, D. L. DuBois, J. Eckert, E. Fujita, D. H. Gibson, W. A. Goddard, D. W. Goodman, J. Keller, G. J. Kubas, H. H. Kung, J. E. Lyons, L. E. Manzer, T. J. Marks, K. Morokuma, K. M. Nicholas, R. Periana, L. Que, J. Rostrup-Nielson, W. M. H. Sachtler, L. D. Schmidt, A. Sen, G. A. Somorjai, P. C. Stair, B. R. Stults, W. Tumas, Chemical Reviews 2001, 101, 953-996.